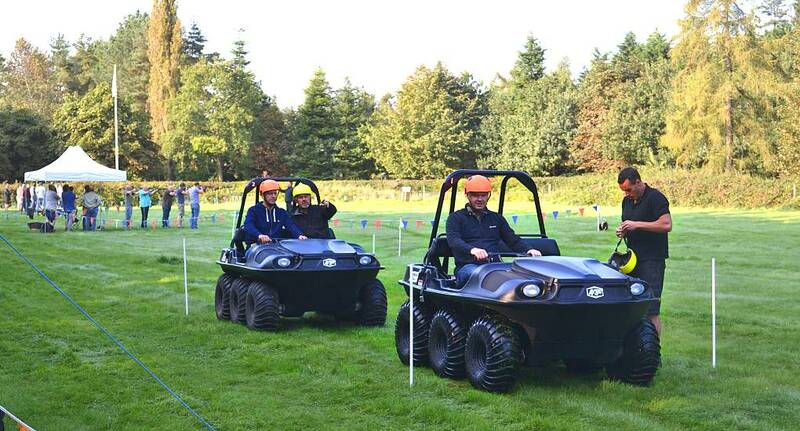 Go off road and then some with the multi-wheel Argocat Amphibious vehicles. These babies can go just about anywhere. Think "banana splits" with those crazy dudes driving like nutters, think fun on land and water, with incredible climbing power and the ability to ride over the roughest of terrain. The buggies are 6 or 8 wheel drive with a steering mechanism that allows the diver to perform 360 degree spins within the vehicles own length. In fact there is no steering wheel. Instead two levers allow steering, acceleration and brake enabling the Argocat to skid steer around corners. The courses we provide are built specially for these vehicles and include a multitude of obstacles, such as water hazards, steep hills, bumpy surfaces, slaloms, hills, mud, ruts and ditches. You might be amazed to know that on a flat surface they can reach speeds of 30 mph, even managing 3 mph when all the wheels are submerged in water.